Jordan Ryan wasn’t expecting the call. 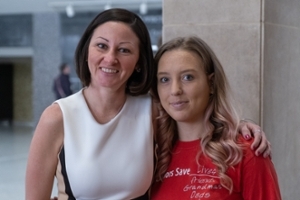 After eight years on dialysis, the young Hamilton woman knew she could die without a new kidney. She also knew her chance of receiving one was slim, especially since a kidney donated by her uncle several years earlier had failed because of her disease. Ryan’s condition grew progressively worse, forcing her to stop taking classes at Miami University in her third year. On July 14, 2018, her cell phone rang. “We think we found one,” Becky Harris, kidney exchange transplant coordinator at University of Cincinnati Medical Center, told her. It was the miracle match the family had prayed for. Though donors and recipients can choose to remain anonymous, Ryan wanted to meet her donor a week before their Aug. 15 surgeries. In walked Veronica Mullen, Miami’s director of operations for the women’s basketball program, who became a donor after hearing how her best friend’s father benefited from a kidney transplant. Mullen said she just genuinely wanted to help someone. If she could do that, it would be worth it. She ended up accomplishing so much more — helping eight people receive new kidneys, including Jackson Chase, the teenage son of Miami professor Melissa Chase. The senior at Talawanda High School had been on a waiting list for two years. 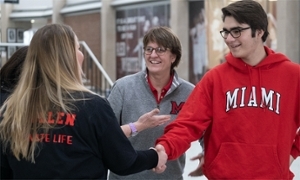 Mullen was able to have such a wide impact thanks to the National Kidney Registry, a network across the country in which live donors are matched with recipients based on computer algorithms. All it takes is a good samaritan like Mullen agreeing to donate to kick off a potential chain of donations. Melissa Chase said the registry is set up in a such a way that someone can donate a kidney to another recipient in exchange for a compatible kidney for someone they know. Mullen donated to Ryan on behalf of Chase’s son, which meant the registry immediately started searching for a match for him. His new kidney came from a woman in Philadelphia, who had donated so her husband could receive one. Miami professor Melissa Chase (center) and her son Jackson meet Veronica Mullen's family. Ryan’s husband, Jimmy, also donated a kidney, which went to a transplant recipient in Chicago, and so on. There are two chains only connected through Mullen, “so if Veronica Mullen had not done this, neither Jordan nor Jackson would have a kidney,” Melissa Chase said. The professor of sport leadership and management (SLAM) and sport psychology said her family knew nothing about how the registry worked until her son’s life was touched by Mullen. Mullen is glad she was able to indirectly help Chase, who had played basketball and run cross country until his condition forced him to give up the sports he loved. Mullen wanted to spotlight the importance of organ donation so “Donate Life” became the theme of the Jan. 12 home women’s basketball game against the State University of New York at Buffalo. Before the game, Mullen’s family gathered on the Millett Hall concourse with Ryan, Chase and their families. It was a moment to celebrate new beginnings — and Ryan’s 27th birthday, which happened to fall on the day Mullen randomly picked for the event. There were plenty of hugs and happy tears. 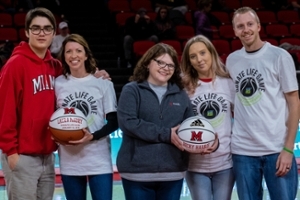 At halftime, Chase and Ryan presented their transplant coordinators Laura Mooney and Becky Harris with commemorative Donate Life game balls. Jackson Chase, Jordan Ryan and her husband Jimmy with kidney exchange coordinators Laura Mooney (second) and Becky Harris (third) at halftime of the Jan. 12 game. “It just amazes me all the work that went into it,” said Mullen, wanting to recognize them as unsung heroes working behind the scenes to help coordinate everything. Harris had been Ryan’s nurse at Children’s when she was younger and “watched her go through this whole process year in and year out,” Mullen noted. She’s now at UC Medical Center, where Mullen’s and Ryan’s surgeries occurred. Ryan and Chase had not met until the game. “Children’s has a special place in my heart, so the fact that a kid at Children’s got it, too, it was too good to be true,” Ryan said. Ryan is now a patient care assistant at Mercy Health - Fairfield Hospital. She hopes to eventually work as a transplant nurse or with patients going through the difficult process of dialysis because she knows what it’s like. She no longer needs it herself. As for Mullen, her doctor told her she has no limitations. She’s back to playing basketball and running and has signed up to run a half marathon in May. For more information about becoming an organ and tissue donor, go to the website of LifeCenter, which had a booth at the Jan. 12 Donate Life-themed women's basketball game.